Uni Ball Black 207 Impact Pen delivers an ultra-smooth ink flow from a 1.0mm tip. Sleek and comfortable barrel design features an extra-control rubber grip for superior control. The Uni Super Ink is fade and water resistant with archival quality. 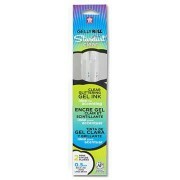 Gel is waterproof, fade-resistant and quick-drying to help reduce smudging.